We have created our shift bits, shift total seconds, shift seconds for the program. Here is the setup for the daily log information: This is where all of the current values will be stored. Note that the format is 2014 11 01 (yyyy mm dd) This will be important when setting up the database for the data. We will determine the total meters per shift. Remember that our counter will give us one pulse every 0.303 meters. 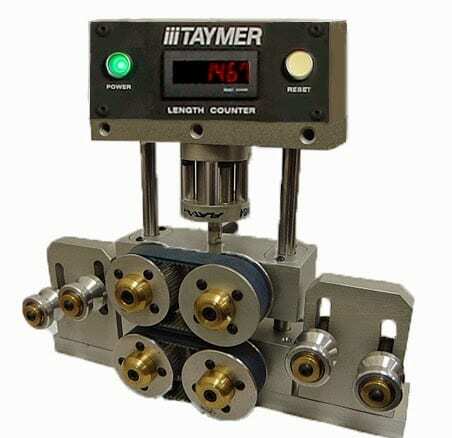 For testing purposes a 50ms internal timer is used. Also the count input should be activated on the leading edge, if the 50ms internal timer is removed. With each pulse of the input, D20 increments by 303. There for after 10 pulses the value in D20 will be 3030. This would represent 3.030 meters of product. To change this into an integer to log the data we will divide D20 by 1000 and store the result in D30. D30 minus ((Int(D30/10000)) *10000) will be placed into MHR14. The same calculation will be used for the other 4 shifts. The shift percent will now be calculated. Remember that D0 contained the total seconds that have passed on the shift and D10 contains the total seconds that the machine was running. This is for weekend 12am shift. Ex. If we want one decimal place in the output register then looking at 75% this should be equal to the value of 750 in the output channel. Now that we have all of the data in the registers we are now ready to log this information when the day changes. That is when the weekend 12am or weekday 12-8am shift bit turns on. MHR1 = 30 means that we are all data has been retrieved. MHR1 = 650 means that we have 31 days of data to be retrieved. A visual basic program will read MHR1. If it is greater than 30 then the data will be read and then written into a database. It will then write the value of 30 back into MHR1 to reset the pointer. MHR10 – MHR27 – As shown above. 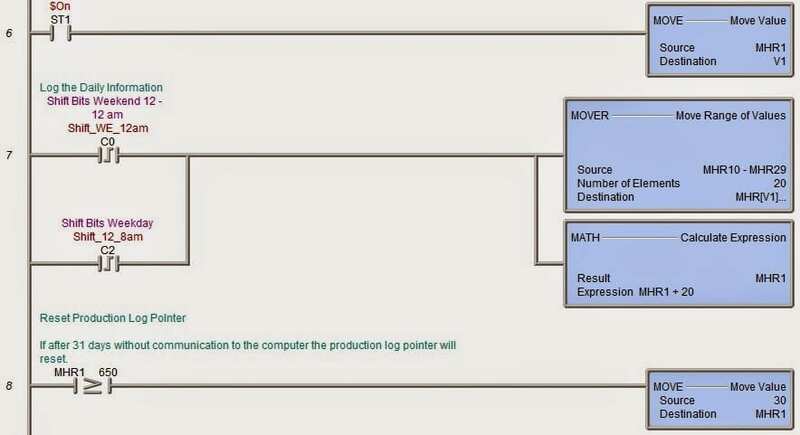 Information will be logged for 31 days without communication from the computer program to reset the log pointer. 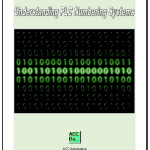 This is all the requirements for logging the daily information in the PLC. We will now log minute by minute information in the next part. 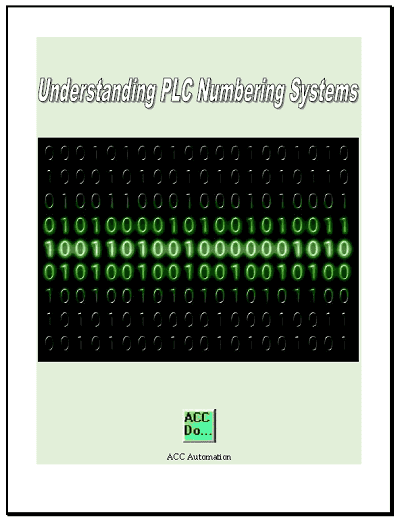 We will finish the PLC programming in part 4 and then continue onto getting the information out of the PLC.